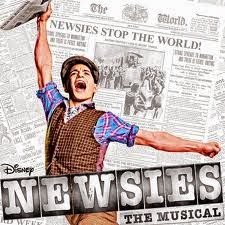 The Broadway musical Newsies just opened last night in SF, and it's totally a family-friendly show. Read a Newsies review here. Those who loved the show tell me they were most impressed with the choreography and dancing, and that the male cast was so strong for a musical and dancing show. Traditionally a lot of dancing is done by women in these shows, so this is a great example to set for boys interested in theater and dance. Of course girls will enjoy that too!